Today, we are announcing organizations. Organizations help manage applications and expand our access management system. The new dashboard allows existing account owners to invite multiple users and (in a few weeks) be able to manage their access. 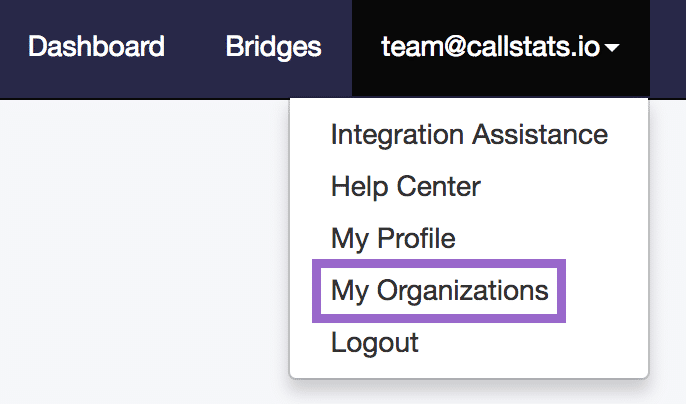 Previously, callstats.io accounts had a single user, which controlled the App and billing settings, now the App and billing settings have been moved under organizations. Lastly, a member of multiple organizations. As of today, each existing user automatically becomes the owner of their organization and all their Apps are moved under the organization. All new users added to the organization become members, which means they can see the organization and app settings but cannot make changes to the settings. They can view the data and conduct searches in all parts of the callstats.io dashboard. Currently, new organizations can only be created by registering a new account with callstats.io. However, ownership of an organization can be transferred to another member of the organization in the settings. A single user can be a member of multiple organizations. For example, WebRTC Platforms as a Service (PaaS) can have access to their clients callstats.io organizations using the a single user account. When looking at metrics in the dashboard switching between organizations and their respective apps can be from the drop-down menu located in the top-left corner of the dashboard, which was previously used only for switching between apps. We will be adding user groups and roles to the organizations in the coming weeks. With roles users can be put into groups that have different access and edit rights on per app basis including certain access to certain features or settings. We will be announcing roles in the upcoming week, subscribe to our blog to keep up with the updates.